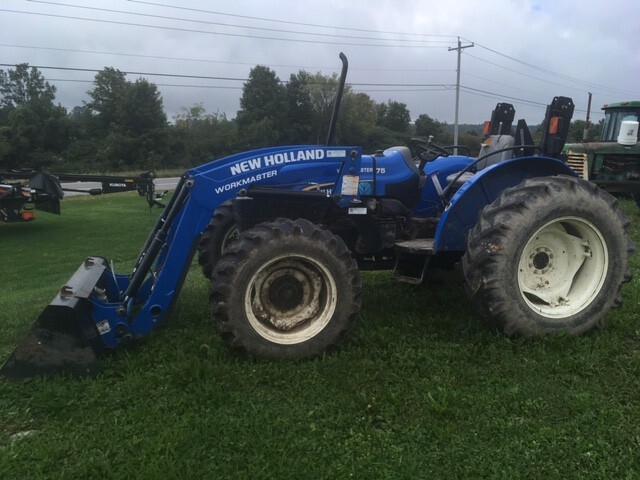 2013 New Holland Agriculture WORKMASTER™ Series - 75 FWD for sale in Oneonta, NY. Sharon Springs Garage, Inc. The Power behind a Job Well Done: Ample power and a durable design make routine chores and ambitious projects easy. Four WORKMASTER™ models let you choose between 45, 55, 65 or 75 engine horsepower, that offer a quiet start-up and smooth, fuel-efficient operation. Tier III emission compliant engines protect the environment and give you the flexibility to run on B5 biodiesel blends (WORKMASTER 45 and 55) or B20 biodiesel (WORKMASTER 65 and 75). Smooth and Responsive: Whether you choose the naturally aspirated WORKMASTER™ 45 or the turbocharged WORKMASTER 55, 65 or 75, you'll work in confidence. All models feature an indirect mechanical fuel injection for quick response and smooth operation while boosting fuel efficiency and reducing emissions. And timed glow plugs ensure an easy start on cold mornings. Clean Energy Leader: Tier III emission compliant engines are approved to run on B5 biodiesel blends (WORKMASTER 45 and 55) or B20 biodiesel (WORKMASTER 65 and 75). You'll benefit from fuel flexibility, and boost air quality. Exactly What You Need: You'll find the speeds you need to match any task in the new WORKMASTER™ tractors. Just like an automobile, gears are arranged in a simple pattern, and the WORKMASTER 45 and 55 offer a SynchroShuttle that lets you easily flip from forward to reverse and back again. With operation this smooth, you'll cruise through chores and be ready to tackle your next big project. More Speeds: Match your speed to your application: WORKMASTER 45 and 55: Four constant mesh gears are available in high and low ranges for a total of eight forward and eight reverse gears between 1.76 and 18.6 mph; WORKMASTER 65 and 75: Four gears available in high and low ranges for a total of 8 forward gears and 2 reverse gears between 1.9 and 19.0 mph. Gears 3 to 4 and 7 to 8 are synchronized and allow for "shift on the go" convenience. Easy Maneuvers: After a long day of loader work, you'll understand why the SynchroShuttle transmission, available on the WORKMASTER 45 and 55, comes standard. This high-performance feature provides quick changes in direction with a dash-mounted shuttle lever located at your left hand for effortless maneuvering. Built To Do What Tractors Do Best: Heavy-duty loader work and tough three-point implement applications are all in a days work for the WORKMASTER™. All models are available with a front-wheel-drive axle to give a sure grip and better performance on slippery or uneven terrain. 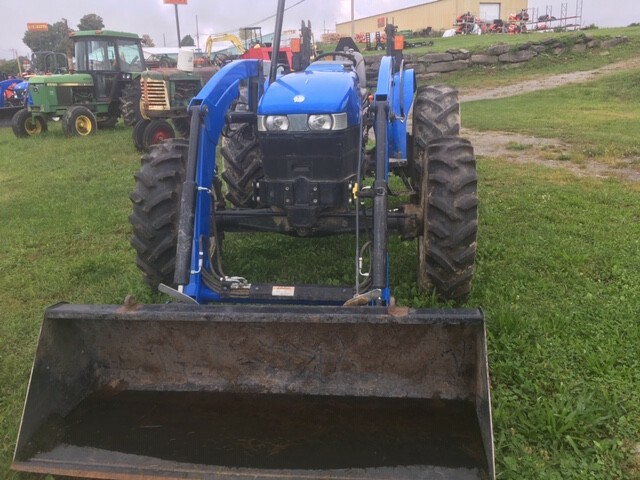 And impressive hydraulic and three-point hitch lift capacity let you take on bigger implements to make short work of any job. Custom Loader: Add a 615TL or 625TL loader and find out what the WORKMASTER is truly capable of. The quick-attach design makes it easy to hook up and remove or switch buckets and attachments. 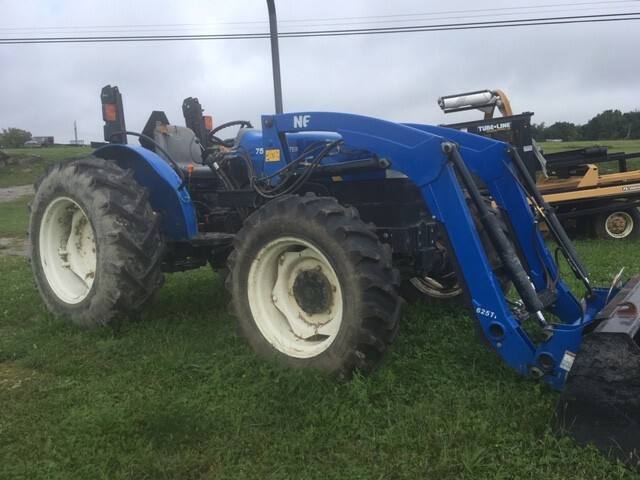 Available FWD Front Axle: If your workday calls for extra traction and stability, the WORKMASTER has your back with mechanical 4WD engagement available on all models. All-wheel-drive traction in an economy class is another way this workhorse outperforms the competition. Powerful Rear Axle: An inboard planetary final drive on the WORKMASTER 45 and 55 rear axle provides incredible strength and a compact design. More space around the three-point hitch area gives you flexibility with implement hookup and wheel settings. Three-Point Hitch: Shouldering responsibility comes easy exceptional lift capacity and mechanical draft control is available on the WORKMASTER 55, 65 and 75. All models feature flexible link ends, telescoping stabilizers and a swinging drawbar to make implement hookup a snap. Tandem Hydraulics: Go ahead and multitask. The open-center hydraulic system utilizes tandem hydraulic pumps so you get all the power you need for steering, rear remote valves and the three-point hitch and loader work. An independent 540-rpm PTO keeps three-point implements engaged even when you change gears, turn or clutch. The Right Fit: Climb aboard and you'll see what a difference attention to detail makes. From the clear path to the seat to the perfectly placed controls, the WORKMASTER™ is designed to make long days in the saddle comfortable and more productive. Prime Seating: This is no one-size-fits-all seat. The deluxe contoured suspension seat adjusts to match operators height. Info At-A-Glance: Bright analog gauges allow you to easily monitor tractor status. Easy-Lift Hood: The one-piece flip up hood lifts on a gas strut for instant access to service areas without cumbersome panels or grills to remove. Quick Oil-Check: Engine oil can be checked from one convenient location, without even raising the hood. Remote valves: 1 Standard open center, rear mounted, color coded lever controls with quick coupler dust covers. Second rear remote is optional.